At the foot of the Atlas mountains just 45 minutes from Marrakech is this stunning Berber tented village! The tents are air conditioned and a swimming pool is on site. Spend the evenings around the huge, roaring fire. Spend your days relaxing and chilling. Activities such as Rafting, canyoning, kayaking, paragliding, quad bike tours, climbing wall, basketball, archery, treking in the atlas, mountain biking, water polo… the list goes on and on. We can tailor your adventure holiday to exactly what you want. You can even ski in the winter months! This location is ideal for groups and can host up to over 200 people. The whole 7 hectares is surrounded by a wall so you have a exclusive private retreat. Suitable for corporate groups, weddings, hen parties and stag weekend events as well as schools and education travel. In some ways, our age- the age of stress, anxiety, worry, conflicts, and overwork – is the outcome of our craving for facilitating life. This has been achieved at the expense of our inner peace. Concrete buildings have replaced trees and green fields. People have grown less trusting and approachable. Everybody is likely to reminesce the old, peaceful days when people were in direct contact with nature. Feeling tired-out is nature’s way of telling you to rest. When was the last time you went bivouac? Why pay those outrageous hotel bills when you can camp inexpensively and give yourself and family an adventure at the same time? When you are camping you will know what true togetherness is. Since you are sleeping outdoors, the sun wakes you up early. You will be spending most of your time outdoors, enjoying the beauty of nature and the fresh air and there is plenty of time for just plain talking to each other. Whether you are enjoying fishing in a lake or hiking in the mountains, there are plenty of fun activities, and there is not the hustle and bustle of rip-off tourist attractions. It is a great opportunity to get back in touch with nature and each other and is also one of the most inexpensive vacations you will enjoy and remember for a long time. Berber Colors: a unique concept in Morocco. – Tent tops are covered with waterproof tarpaulin. – Four windows with mosquito nets. – Comfortable beds: mattress 190/90 cm. The bivouac has round shapes, the sign of union, surrounded by green gardens. ­64 sinks with mirrors, lights and electrical outlets. Across from the tents, there is a large circular garden in. A closer look at it will allow you to feast your eyes on a variety of flora- lawns, shrubs, flowers all lit up by Moroccan-style lanterns. In the middle of the camp ground, there’s a camp fire dug 1,5 m in the ground and with a diameter of 20 m. It is surrounded by a structure made of wrought iron which is built to prevent sparks of ember from reaching people. It is a place for gathering and fun. The amphitheater with an auditorium can host up to 500 people along with a platform for delivering speeches. It is also an arena for dance lovers. The ground is a giant chessboard. There is also a large bar for night parties and a lighting system. Three large rooms measuring 180m2 each .they’re logistically furnished and easily adjustable. 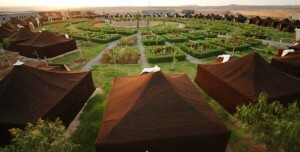 The rooms can host up to 400 people and can be used for different purposes such as coffee-breaks, Cocktails, open-bars, meals…They’re also surrounded by lawns, flowers, orange and olive trees, and a small pergola. Behind the pergola, there is a private swimming pool reserved for seminar attendees. The kitchen has two levels: The basement is used for storing food in a refrigerated chamber. Preparing meals takes place on the ground floor. 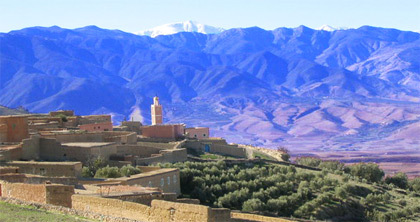 Visitors are welcome to try Moroccan recipes, take tours of the kitchen and watch the preparation of local specialties. ­drinks and cocktails are accompanied by salted foods (grilled peanuts and almonds, chips or pop-corns, olives). ­the foods on the menu are prepared by local women assisted by a chef wood-burning ovens are available for those who like naturally cooked meat. ­Canoeing and kayaking on The Lake. The latter offers breath-taking views of snow-capped mountains. ­The whole estate is surrounded by a wall measuring 4 m high. Each tent is equipped with speakers. As a safety precaution, each tent is equipped with fire extinguishers. -Excursions to nearby towns. Taking tours of historic sights, souks….